The Netherlands didn't escape the horrors of World War II. In 1939, the Dutch government erected a camp near the town of Westerbork to house (mostly jewish) refugees from Germany. The nazis later turned Camp Westerbork into a concentration camp. A total of 107,000 people passed through the camp; a mere 5,200 of them survived the war. The tombs in this picture mark the number of people deported to the extermination camps at Sobibór, Bergen-Belsen, Theresienstadt, Mauthausen and Auschwitz-Birkenau. Close-up of the Sóbibor tomb. The text on the front reads, "34,295 Jews from the Netherlands were murdered in Sóbibor." The number on the top (34,313) marks the number of Jews deported from Westerbork to Sóbibor. Close-up of the Auschwitz-Birkenau tomb. The text on the front reads, "More than 56,500 Jews and more than 200 Sinti and Roma from the Netherlands were murdered in Auschwitz-Birkenau." The number on the top (60,330) marks the number of Jews and gypsies deported from Westerbork to Auschwitz-Birkenau. Camp Westerbork. Areas of elevated terrain mark the location of the main buildings. This was a large living quarters. A partially rebuilt lavatory at Camp Westerbork. The National Monument at Camp Westerbork marks the starting point of the final journey of some 100,000 people. The rails are attached to 93 ties, signifying the number of trains that departed Westerbork. The National Monument at Camp Westerbork. The bent rails express the despair felt by the people deported from Westerbork. A wreath at the National Monument at Camp Westerbork remembering Operation Market Garden. The white card reads, "The Market Garden old comrades remember with sadness and gratitude all those men and women who died in the liberation of the Netherlands and northern Europe. We will remember them." Another wreath at the National Monument at Camp Westerbork. The Monument of the 102,000 Stones at Camp Westerbork commemorates the Jews, gypsies and resistance members who died after being brought to Westerbork. The Monument of the 102,000 Stones at Camp Westerbork. The stones are adorned with a star of David, a flame or nothing to signify Jews, gypsies (Sinti and Roma) and resistance members. The house of the commandant of Camp Westerbork, Albert Konrad Gemmeker, is one of the few remaining original buildings. The weather was good, with temperature above average, little wind and only two rainy days. View from our bungalow on the final afternoon. 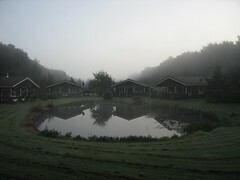 Fog surrounds a group of bungalows on a bleak autumn morning.